The creator of the PowerEgg, an ovoid flying robot, has begun accepting orders for its newest creation, a submersible camera drone for home use. Dubbed the PowerRay, the waterproof device can find, attract and record fish. It operates at a depth of 30 meters, or about 98 feet, for up to four hours at a time. It is suitable for use in fresh-, salt-or chlorinated-water. The PowerRay garnered buzz when PowerVision Technology Group first announced it at CES in January 2017. Of course it was a crowd pleaser among technophiles. But it remains to be seen how outdoor and marine biology enthusiasts may embrace or reject this technology. The basic package, the PowerRay Explorer, has a 50 meter cable that tethers the device back to a base station above water. Besides keeping the drone from getting lost in a strong current, the cable transmits power to and video from the PowerRay back to the base station. All PowerRays have a 4K camera on board. ZEISS provides optical components to PowerVision. The PowerRay Wizard edition includes a VR headset that lets users watch what they’re recording in a kind of immersive open water exploration that doesn’t require a wetsuit. The PowerRays cost from $1,488 to $1,888 in the US, and €1,599 to €2,099 in European markets. PowerRay faces competition in the US market from makers of other underwater drones and waterproof cameras, most notably the deeper-diving Trident made by startup OpenROV. 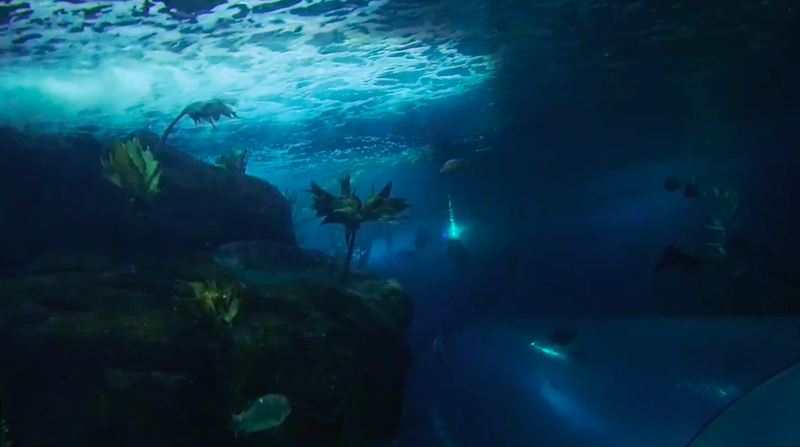 PowerRay footage captured underwater at the Aquarium of the Bay in San Francisco. We met up with the CEO for a PowerRay launch party at the San Francisco Aquarium of the Bay this week. The aquarium barred PowerRay pilots from “swimming” in tanks with sharks, because they would be likely to try to eat the submersible drones. However, we were able to see the PowerRay approaching perch and sea bass and a range of other marine wildlife, as well as navigating through the currents and kelp in the aquarium tanks. Surprisingly, the fish didn’t flee. Then again, as fish go, these were already fairly accustomed to electronics. Updates: We added PowerVision’s U.S. prices for its PowerRay submersibles after our post originally ran. The post previously reflected European prices only.